It’s time for a new sketch at Freshly Made Sketches. This week our sketch has been designed by Amy O’Neill. Amy creates beautifully detailed cards and always with the perfect use of colours. Head over to her blog and take a look. Look at this! I’ve created my second Christmas card for the year! I enjoy combining non traditional colours for Christmas – not to say I don’t like traditional colours – but I like mixing them up just as much. This week my card started with this strip of DSP from Birthday Memories Designer Series Paper. I decided to add a rectangle of black behind my DSP and went from there. My die cuts are cut with my Pretty Pines Thinlits Dies and my sentiment is from Holly Berry Happiness. I ended my card with three black sequins. The team at Freshly Made Sketches have created wonderful cards with Amy’s sketch. Pop over to the blog and see what they’ve created. 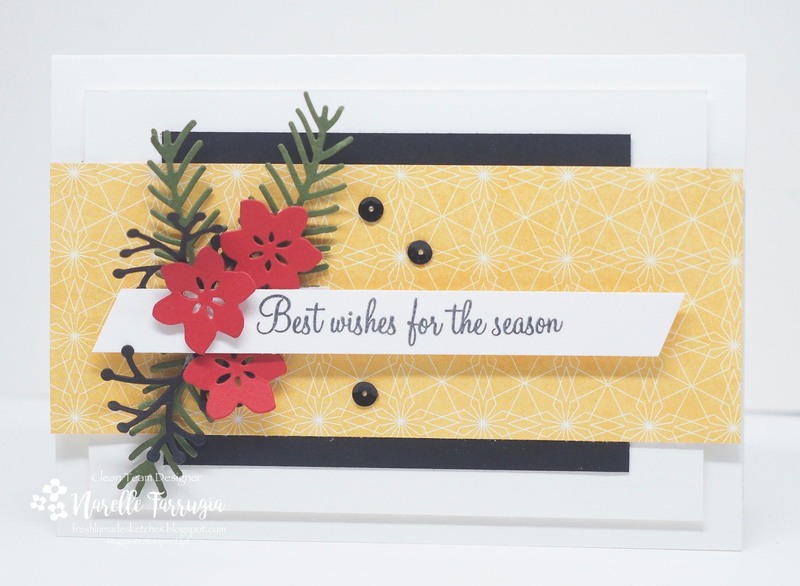 I love your non-traditional colors for this pretty Christmas card! I don’t remember those beautiful red flowers in that set — I’m going to have to remember that. Great way to use the sketch, Narelle! I’m just in awe of this. First, the card is so pretty….oh the colors!!! And then, really….you are an overachiever. I’ll just accept that I can never live up, lol!!! I love non-traditional colors for Christmas too but I don’t think I’ve ever thrown a bit of black into my card. Well thanks to you that’s going to change! What a fabulous card. Thanks for the inspiration! Go you, making a Christmas card and such a gorgeous Christmas card it is, too! Loving these colours! Well you are two cards ahead with the Christmas Cards than me.. my sister is the one in our family who makes them year-long. Love the bright yellow, and the greenery is so nice and fine.